Who doesn't love to travel? Travel buffs, frequent and occasional fliers alike will adore the practicality of these special little destination wedding favors. Brides will love the touch of sophisticated whimsy these place card holders add to any reception table. Each plane-shaped tag is crafted of substantial chrome and is dotted with charming heart-shaped windows. Attached is a black adjustable leather strap. 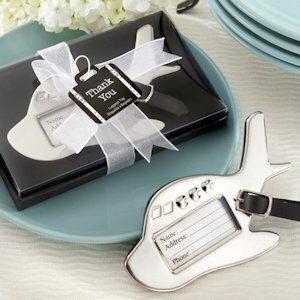 Each of our luggage tag wedding favors measures approximately 3 1/4" from nose to tail. Each luggage tag comes packaged in a black bottom gift box with sheer organza ribbon and luggage thank you tag. 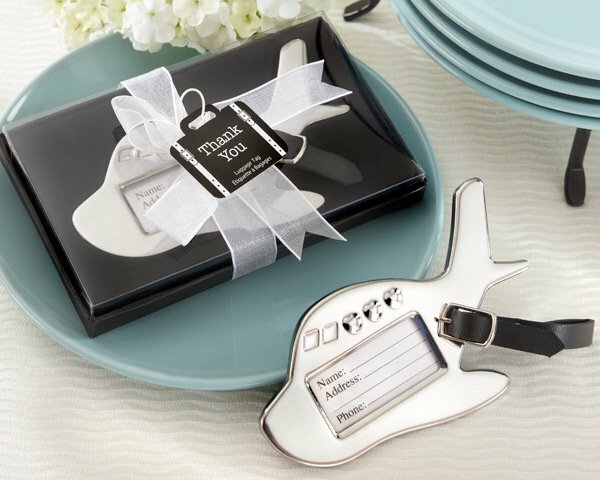 What a great way to thank your guests for traveling to your wedding!